Coronations are grand ceremonies indicating a single transferal of power. 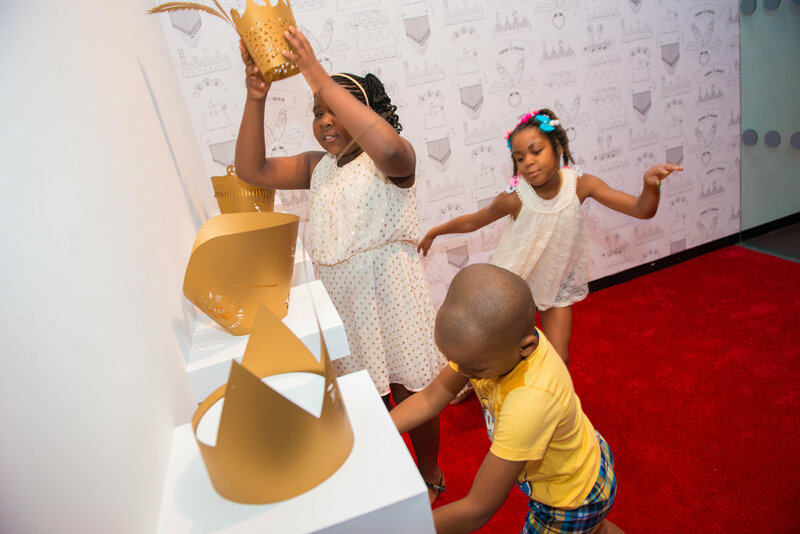 In The Crown Futures, artist Shani Peters worked with the Sugar Hill Children’s Museum to partner with young people in disseminating an empowering message of self-determination. Shani’s exhibition was the first to be produced under the auspices of the Artist/Children’s Collaborative, a hands-on artmaking program, led by an artist, through which children also play a key role in the development and creation of a new artwork or installation. To lead children through her artistic practice - which is rooted in social justice principles - she facilitated a five- week artmaking program that included discussions of power and class, and stressed the importance of loving one’s self by prompting children to design crowns with materials inspired by their individual heritage. The laser cut paper sculptures exhibited were Shani’s abstractions of collages that the children fashioned from locally sourced materials. A #SelfieDetermination Station featured declarations of strength by our community’s youth and invited viewers to crown themselves and broadcast the coronation on social media. The Crown Futures: Shani Peters in Conversation with Sugar Hill Youth was co-curated by Lauren Kelley, Associate Director, Curatorial Programs and Jennifer Ifil-Ryan, Associate Director, Education & Community Engagement. Shani Peters (b. 1981 Lansing, MI) is a multi-disciplinary artist based in New York City. Her practice encompasses community building, activism histories, the subversion of popular media, and the creation of accessible imaginative experiences. Peters holds a B.A. from Michigan State University and an M.F.A. from the City College of New York. Her exhibitions and presentations in the United States and abroad include the Schomburg Center for Research in Black Culture in New York City; the University of Michigan, Ann Arbor, MI; Seoul Art Space Geumcheon in South Korea; and the National Gallery of Zimbabwe in Harare. Selected residencies include those hosted Lower Manhattan Cultural Council, Museum of Contemporary Art Detroit, the Laundromat Project, and Project Row Houses, as well as a residency in Seoul, South Korea sponsored by apexart. Peters’ work has been featured in the Art Papers magazine and the New York Times. Her work is recognized and supported by several awards and grants from institutions such as the Foundation for Contemporary Arts, the Rauschenberg Foundation, Rema Hort Mann Foundation, and the Joan Mitchell Foundation. Peters is an educator, focusing her teaching at the intersection of art and politics.